This year marks the 50th anniversary of the founding of the Illinois Railway Museum, which in the intervening years has grown to have the largest collection of preserved railway equipment in North America. IRM is engaging in a year-long celebration to commemorate this event, and included in that celebration are efforts to tell the story of how the Museum developed into the organization it is today. 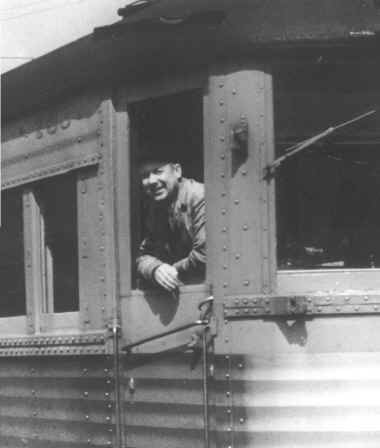 Howard Odinius, founder of the Illinois Railway Museum, leans out of a North Shore interurban car. 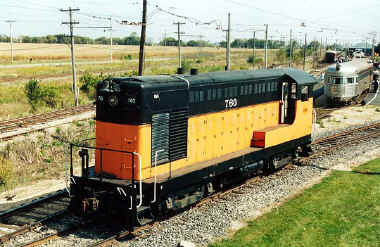 All photos courtesy of, and are the property of, the Illinois Railway Museum. All rights reserved. Photos may not be reproduced in anyway without the express written permission of the Illinois Railway Museum. Like many railway museums, IRM's beginnings were humble. The one man more responsible than any other for the founding of the Museum was Howard Odinius, an interurban fan with a particular love for the Indiana Railroad. When IRR ceased operating in 1941, Odinius made an effort to establish a museum group to save one of the last cars - IRR 65, a modern lightweight interurban. Failing to gather enough support to preserve the car, he instead arranged for another interurban line in Iowa-the Cedar Rapids and Iowa City--to buy and operate the 65. Twelve years later, Odinius was faced with the same dilemma. The Iowa line was now retiring the car, but this time Odinius had enough backing to save it. Ten men (IRM's "founding fathers") each contributed $100 and bought the 65, moving it to the grounds of the Chicago Hardware Foundry in North Chicago, Illinois. 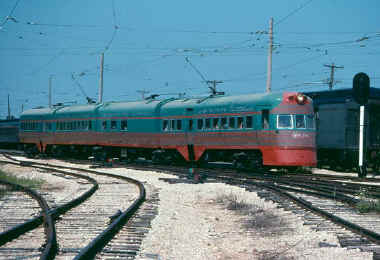 The first of more than 400 cars to be acquired by IRM was Indiana Railroad 65, whose arrival in North Chicago in November 1953 marked the birth of what was then the Illinois Electric Railway Museum. A small group of die-hard traction fans gathered around what then became known as the Illinois Electric Railway Museum. For several years the 65 sat on the grounds of the foundry, receiving some maintenance and attention in the hopes that it could be restored to operation. In 1955 two more cars were acquired; in 1956 the size of the collection increased to six. At this point the IERM collection consisted solely of electric interurban cars, but as early as 1957 the scope began to widen to include streetcars and work equipment. The Museum continued to grow, filling the yard in the corner of the foundry lot to capacity. In 1961 the first steam engine was acquired, an 0-6-0T, and in 1962 two passenger cars arrived. 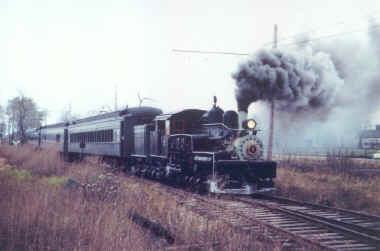 It was at the 1962 annual membership meeting that the decision was made to shorten the Museum's name to the Illinois Railway Museum. 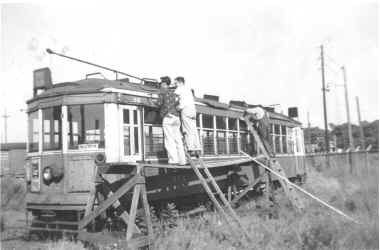 IRM volunteers work on the roof of Milwaukee streetcar 972 during the early 1960's, when the Museum was still on the grounds of the foundry in North Chicago. The greatest test of the Museum was in 1964. The owner of the foundry, a railfan and supporter of the Museum, realized that IRM was growing too large and taking up needed space, so he asked the Museum to relocate. Several new sites were considered, including interurban branches in Batavia and East Troy, Wisconsin; but the final decision was to move to a section of abandoned interurban right-of-way in Union, Illinois. Around 35 cars made the move in several different "hospital trains" and trucking movements during 1964, and by 1965 all Museum equipment was completely moved. The first heavy interurban to operate at IRM, car 431, stands at the original 1966 Olson Road loading platform that was the gateway to the Museum for the first few years at Union. IRM lacked money and resources to build much track at Union. About a mile and a half of right-of-way was owned with an additional 3.5 miles claimed for delinquent taxes, but the equipment was stored in one long line just east of the town of Union. During 1965 and 1966 track was built along the entire mile and a half of available right-of-way, trolley wire was strung, and a switch with a short stub-end siding was built so that an operational car could be switched to the head of the line. On July 17, 1966 IRM became an operating railway museum when Illinois Terminal interurban car 415 started moving for the first time under its own power. 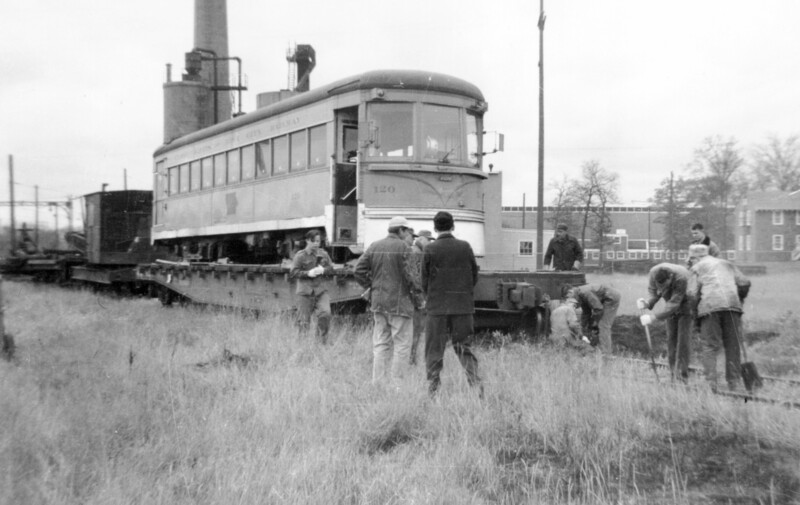 Within a year three electric cars were running, and on October 29, 1967 the first steam operation at IRM was accomplished using J. Neils Lumber Shay 5. 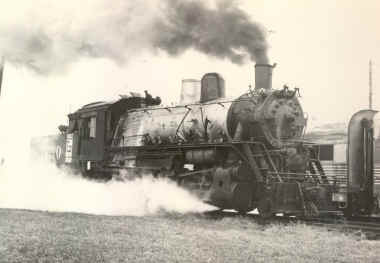 This picture shows the first ever steam operation at the Museum. J. Neils Lumber Company Shay 5 did the honors on October 29, 1967. 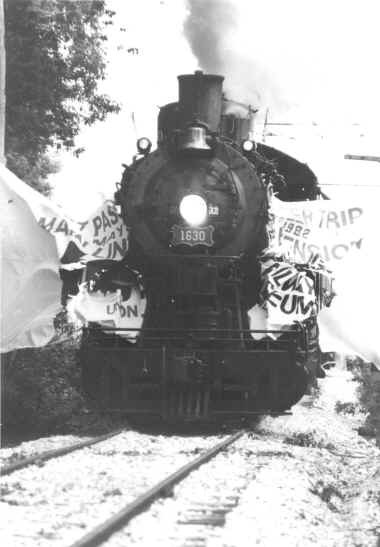 The first run of Frisco 2-10-0 1630 took place on September 28, 1972. Since that time the "Decapod" has seen more service at IRM than any other steam locomotive. Between 1967 and 1980 IRM expanded substantially both the size of the collection and the scope of its facilities. The depot in Marengo, a few miles down the North Western, was moved to IRM in 1967; in 1968 the Burlington's Nebraska Zephyr was acquired, with an E-5A locomotive to pull it coming the next year; and in 1969 a small heated woodworking shop was constructed. 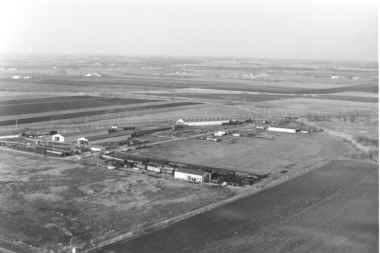 Four separate storage yards were built between 1969 and 1972, and the first storage barn was constructed in 1971. 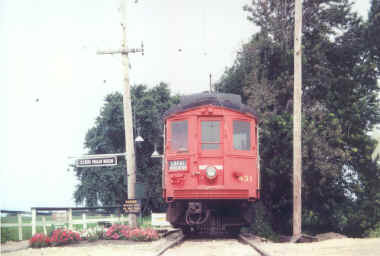 In 1973 IRM acquired the entire collection of the Electric Railway Historical Society, a streetcar preservation group. This is what IRM looked like from the air during the late 1970's. 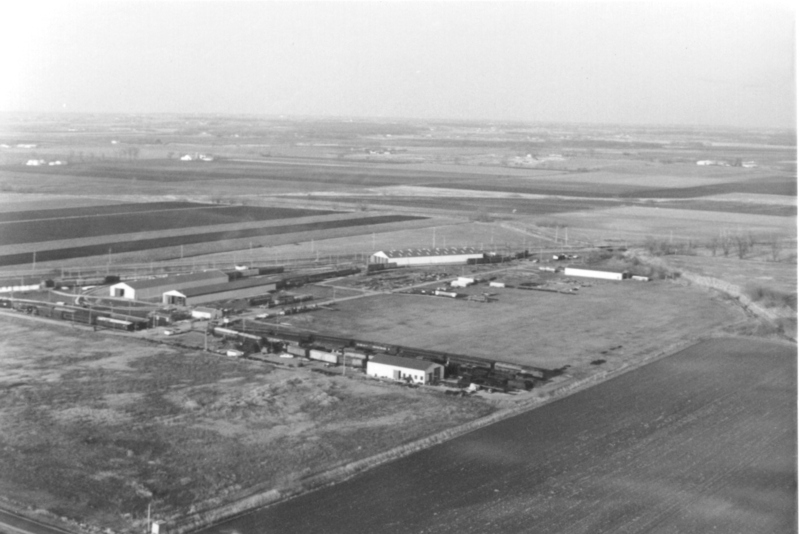 In the foreground is the Steam Shop; the empty field beyond it is now filled with carbarns and storage tracks. One of the most historically significant items in the Museum's collection is the Burlington Nebraska Zephyr articulated trainset, acquired in the late 1960's along with E5A 9911A. The expansion of the electric railway collection has brought into the collection such notable pieces as a North Shore "Electroliner" articulated trainset. The Museum began to take on its eventual shape during the late 1970's. More storage barns were built: by 1980 IRM had four storage barns, plus a trolley bus storage barn, a steam locomotive shop, a woodworking shop and a refreshment stand. During these years, title issues were resolved on the right of way and additional acreage purchased adjoining the original 26 acres. The size of the collection had increased to approximately 150 pieces of equipment by 1980, and had grown in scope to include diesels as well as steam engines. 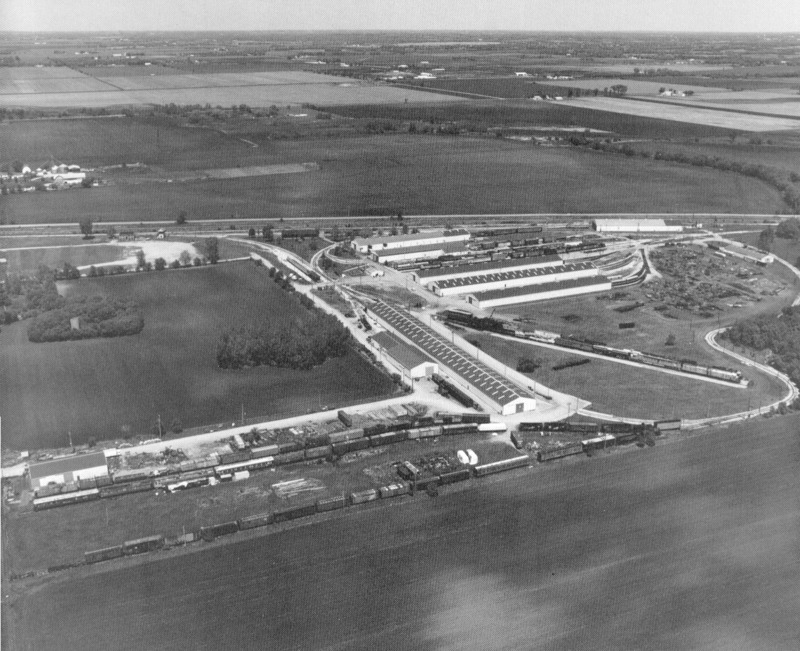 In 1980 the perimeter of the main campus was defined by the construction of a one-mile streetcar loop that skirted the edges of IRM's property, encircling most of the Museum's display areas and allowing regular operation of streetcars on a separate circuit from that of the interurbans and mainline railroad equipment. During the 1980's and 1990's, IRM built up one of the largest and best collections of historic diesels in the country. 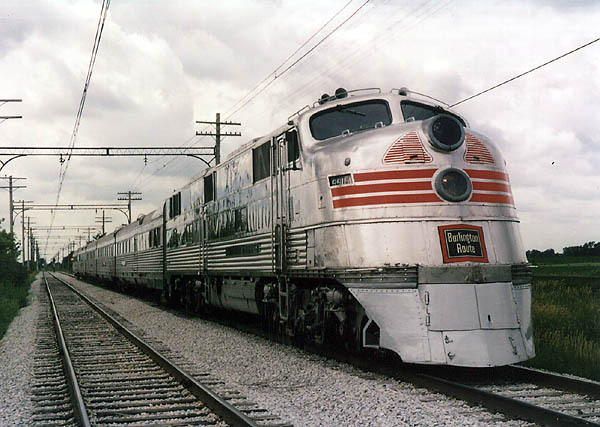 Included in the fleet of 40-odd diesel locomotives is the first Fairbanks-Morse locomotive built, Milwaukee Road 760. Frisco 2-10-0 1630 breaks through a banner announcing the extension of the Museum's main line on May 31, 1982. From a length of less than one mile in 1964, IRM has gradually extended its main line to its current length of 4.9 miles. The 1980's were marked largely by a great increase in the size of the collection of rolling stock. Around 100 pieces of equipment were acquired during that decade, increasing the size of the collection to over 250 and solidifying IRM's position as North America's largest railway museum. Many of the new additions were diesels. IRM was one of the first museums to preserve historic diesels, meaning that a large number of historically significant pieces were brought together in one place. New electric cars were also added to the collection - IRM acquired most of the historic collections of the Chicago Transit Authority and The Wisconsin Electric Railway Historical Society, between them around 20 cars. More yards and storage barns were built to store and house the new additions to the collection, and by 1990 the property had taken on the approximate layout it has today. This aerial view of the Museum, taken late in 1994, shows the development of the campus much as it stands today. 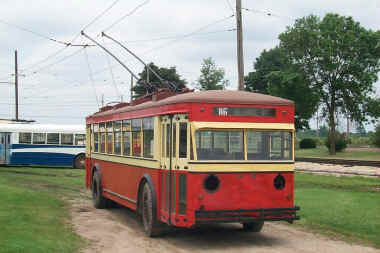 The past decade or so has seen more expansion of the collection of historic equipment - including buses and trolley buses, IRM's collection of rolling stock stands at approximately 410 pieces - but more markedly has seen the development of the physical property and an increasing emphasis on improving visitor accommodations. During the early 1990's a street paving program began in earnest, and by 2002 IRM had over half a mile of paved roads just within the main museum campus. Storage barn aisles were paved to allow handicapped access; the appearance of the property was improved with ongoing clean-up campaigns; permanent displays, such as the "monument walls" and historic signage, were installed; and in 2001 new washroom facilities were opened. 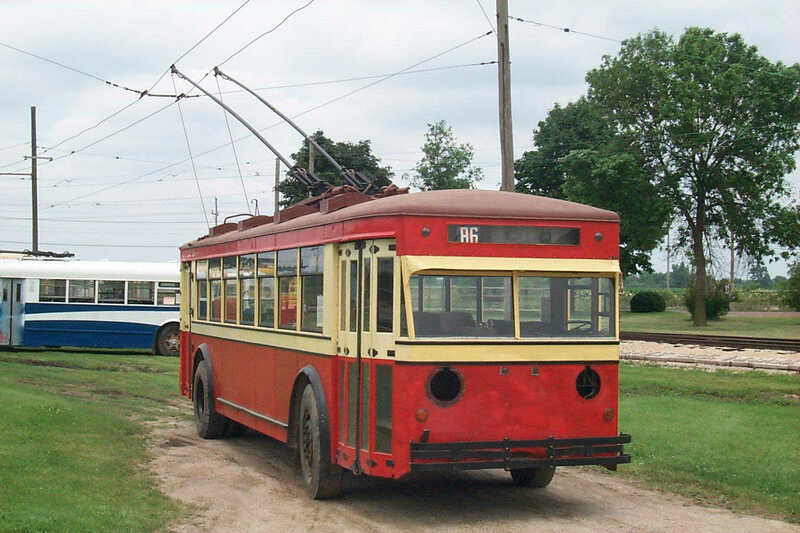 IRM is the only museum in North America with a regularly operating electric trolley bus line. This photo of Chicago Surface Lines 84, thought to be the world's oldest operating trolley bus, was taken before the IRM trolley bus route was paved in 2001. The sheer size of the Museum would lead one to believe that a large staff is needed to run the place; but in fact, the bookkeeping and everyday operations of the Museum are directed by a staff of fewer than half a dozen people, some of them full-time employees and some volunteers. The active membership consists of perhaps 200 volunteers, fairly evenly divided between shop workers and train operators. During the summer, trains are operated every day of the week; weekends will often see from three to five trains in operation on the five-mile main line, in addition to streetcars on the streetcar loop. There are around 35-40 pieces of equipment used in operations on a regular basis, with another 50 or so pieces of equipment in occasional use. Restoration activities are constant in each of four separate shop areas. Despite continued challenges in funding and attracting a sustainable visitor base, IRM has managed to maintain and increase its physical plant and its operations. Throughout its history IRM has relied almost entirely on memberships, gate receipts, and private donations; relatively little government funding has been received. Since 1999, the annual Day Out With Thomas events have brought in much-needed publicity and swelled total visitor numbers to the Museum; in 2002 the event attracted over 40,000 visitors in just four days. Hundreds of visitors crowd the station platform as the steam coach train pulls in during Day Out With Thomas 2002. 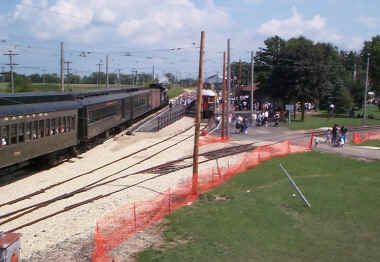 As the Illinois Railway Museum stands at its 50th anniversary celebration, it is one of the most successful independent railway museums on the continent. It is one of only a handful of sites where steam and traction equipment run side by side, and the scope of the collection is unmatched. Expansion of the property and development of the facilities is taking place at a rate rarely before seen, and steps are being undertaken to improve IRM's fundraising capabilities to provide for the Museum's future. The outlook appears bright as the Illinois Railway Museum looks forward to the next five decades. The author wishes to extend thanks to Jeff Brady, John Habermaas, Nick Kallas, Barbara Lanphier and Ray Piesciuk for their contributions to this article.